I feel that I ought to write something about Darren Aronofsky’s mother! … I’m just not quite sure what that should be. The film has received some of the most intense criticism of any movie in recent memory and if you look at on-line comments from viewers, there seems to be a lot of anger and confusion. I personally know some people who went to see it – mostly because of Jennifer Laurence – and hated it in a visceral way. I can’t say I’m surprised; mother!, whatever else it is, is definitely not a feel-good rom-com … nor is it a simplistic genre exercise like the Hunger Games movies. Not surprisingly, given Aronofsky’s past work, what it is is a religious allegory initially disguised as a dark comedy of marital unease which borders on horror. The early scenes are very effective on that level, with Lawrence as Mother, the young wife of a famous poet – Him (Javier Bardem) – who is struggling with a severe case of creative block while she works at restoring his big old house in the country, which had been severely damaged by fire at some point in the past. 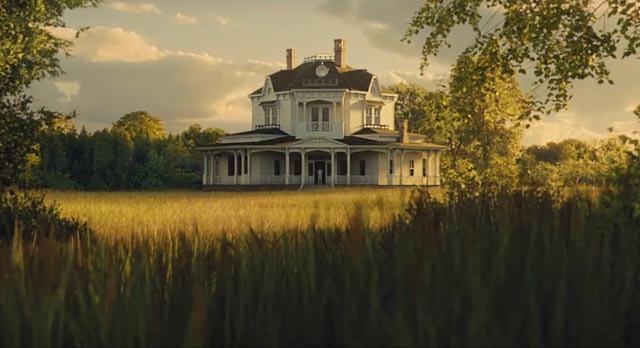 One day, a man turns up at the door – Man (Ed Harris) – who claims to have been told that the house is a bed-and-breakfast. It’s late and, despite Mother’s unease, Him invites Man to stay the night. This is the beginning of a social comedy about personal space being invaded by someone with no sense of boundaries. Before long, Man’s wife – Woman (Michelle Pfeiffer) – turns up and moves in too. Mother doesn’t want these people in her house, but it turns out that Man is a huge fan of Him’s work and has used subterfuge to meet Him before he dies from some terminal illness. Him can’t bring himself to kick the couple out, partly out of pity for Man’s imminent death, but more it seems because his ego is flattered by Man’s admiration. As Him puts his own gratification above Mother’s unease, Woman expresses increasing hostility towards the younger woman, who feels herself being pushed aside. Things only get worse when the couple’s feuding sons – Oldest Son (Domhnall Gleeson) and Younger Brother (Brian Gleeson) – arrive, triggering a horrific act of violence as they play out their sibling rivalry. Up to this point, although there are intimations of the allegory woven throughout, the film plays as a tense psychological horror story, seen entirely from Mother’s point-of-view as her identity, indeed her presence, is all but erased by these intruders and Him’s intensifying response to their presence at her expense. And then it all comes unhinged, as all pretense to any kind of narrative or psychological realism is swept away by the allegory bubbling to the surface. The act of violence and its aftermath unblocks Him’s creativity and he sets to work on a masterpiece even as Mother discovers that she is now pregnant. When the new work is released into the world, increasing hordes of admirers pour into the house, with factions forming as different groups begin to claim the authority to understand the true meaning of the text; factional disputes break out … people begin to tear the house apart in order to possess relics … and eventually there are riots, armed police appear and crack heads, and armies turn up and clash. In the midst of chaos and war, Mother gives birth and Him’s worshipers demand access to the child. Mother tries to keep him safe, but eventually has to sleep … and Him takes the child and presents it to his followers. Who tear the baby apart and eat it in order to get closer to Him. The Judeo-Christian underpinnings are finally brought into clear focus. The film posits a contrast between the natural, sustaining creativity of the female principle (Mother) and the sterile intellectual creativity of the patriarch (Him), which gives rise to greed, envy, conflict and destruction. Him creates purely in order to gratify his own ego, even at the cost of his own son’s life and the destruction of the female. The house burns again and at the film’s end the whole cycle begins once more. If it all ends up being a bit much, there’s no denying that Aronofsky brings bravura filmmaking style to the project. The cast is terrific; Harris and Pfeiffer are excellent as houseguests from Hell and Bardem plays god as a monster of ego, while Lawrence elicits a great deal of empathy despite an uncomfortable deference to Him which turns her into something of a doormat for everyone who invades her space. Aronofsky has been an interesting filmmaker since he first showed up in 1998 with Pi. His work reveals an uncommon ambition and a willingness to follow his material into places where he risks incomprehension and ridicule. And always, he takes stylistic risks. The Wrestler (2008) and Black Swan (2010) are a matching pair in which he traces the psychological consequences for a man and a woman who push themselves beyond rational physical limits; Requiem for a Dream (2000) is a feverish evocation of addiction as experienced from the inside; The Fountain (2006) is a visually exquisite attempt to examine romantic passion as a principle which lies outside of individual emotional experience; and Noah (2014) is the greatest Biblical epic ever made, an absurdist fantasy which illuminates the nonsense foundation on which religion is based by treating Genesis literally (which is why so many literal believers were offended by it). It’s easy to see why mother! has been displeasing audiences, but I’m glad to see that Aronofsky continues to be determined to pursue his own obsessions with so little regard for commercial considerations. It’s great that a mainstream company like Paramount would take on such a project and hopefully the film does well enough, despite audience confusion and critical antipathy, to inspire continued support for Aronofsky. This entry was posted in Review and tagged Actors, Black comedy, Directors, Horror. Bookmark the permalink.